One of the problems that we usually face when learning English is how to learn new vocabulary. At school we are usually taught new vocabulary by learning by heart big lists of words in English with their corresponding translation. It’s not a natural way of teaching but a “brute force” method. It’s not useful to memorize a word and then never use it again; you’ll surely forget it in less than a week. When you learn a word from a list you only learn how to write it but not how to pronounce or how to use it in context (in a sentence). However, there is no doubt that the process of learning new vocabulary is a process of repetition where memory has vital importance. The better your memory, the fewer the number of times you’ll have to repeat a word in order to learn it. I believe that you learn a word in English when you know how to pronounce it properly, write it and use it (in a sentence). I’m going to describe below a method that I’ve used to learn new vocabulary. 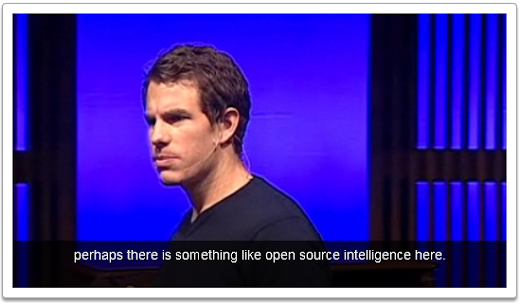 The idea is to use subtitled videos in English (in this case videos from TED mentioned in this post). You choose a video that you like and then through watching it several times you see the evolution in its understanding and learning of new words. Subtitled videos are an excellent tool because they allow you to see the word (you learn how to write it), listen to it (how to pronounce it) and you see in which situations it’s used (its context). Videos from TED are made by people that speak fluent English therefore they are recommended for people with an upper-intermediate or advanced level. Nevertheless, if you wish don’t hesitate to use this technique. You can also use it with other videos that are more appropriate for your level of English. What does this method to learn new vocabulary consist of? First thing you have to do is choose a video. In my case I chose the video which talks about the mathematics of war. Then try to watch the video without subtitles and estimate how much you understood. In my case I understood 80%. Watch the video a second time (without subtitles) and estimate your understanding again. In my case 85%. Now a third time but turn on the subtitles in English. I understood 90%. A fourth time with the subtitles again. I understood 90%. In my case the improvement between the third and the fourth time is zero. This is because I wasn’t able to understand more words on account of the context; plus the words that I didn’t know I needed to look up in a dictionary. I got down to work and I created the following table with four columns (Word, Meaning, Form and Example of use). Note: You might have to adapt the Meaning column to your native language. Adjective As a naive New Zealander I thought, well, I’ll go to thePentagon. Stream Canal Noun If we can get enough of these streams of information together. Pull out Sacar, extraer Verb It’s all in the streams of information we consume daily; we just have to know how to pull it out. Plot Trazar, marcar Verb We plot data for sample on this (in a graph window). Blew my mind Me rompió los esquemas, me dejó “flipando” Verb … of theway attacks are ordered in this conflict, and this blew our minds. Clustered Apiñarse, agruparse Verb The slope of these lines clustered around this value of Alpha equals 2.5. Slope Pendiente (término matemático) Noun Negative Alpha is the slope of that line I showed you before. Coalescence Coalescencia – propiedad de las cosas de unirse o fundirse. Noun So we look at a process of group dynamics coalescence and fragmentation. Seemingly Aparentemente Adverb Why should these different, seemingly different conflicts have the same patterns? Surge Levantamiento Noun The system gets perturbed, it moves upwards to a fragmented state and this is when the surge happens. 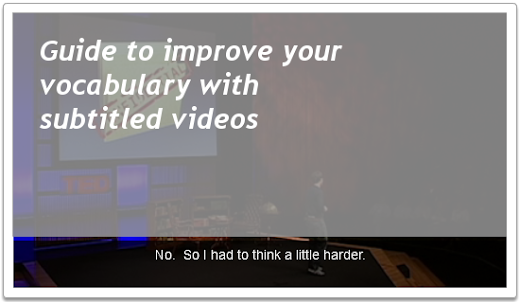 A week later I reviewed the learned vocabulary and I watched the video one more time (without subtitles). I understood 98% - 99%. Well, the way of learning depends a lot on everyone. If you want to optimize this particular method you’ll have to adapt to the way you learn and have regard to your own personal qualities. In my case I have a normal memory and thus it’s necessary for me to REPEAT things several times. If you have a good memory (which is really good to learn languages) you’ll probably be ok if you watch the video a couple of times. I didn't know about TED and it's awesome. A few days ago I suggested to a student that he should try to write down the script of youtube vids but this one is much better not only because of the script being there but also because of the superior quality. Thanks a lot!